If you’re anywhere near the northeast coast you’ll know that this winter has been a particularly cold one. And after a long cold day of battling the snowy world outside, there’s nothing better than sitting down to a warm bowl of soup to warm you up. 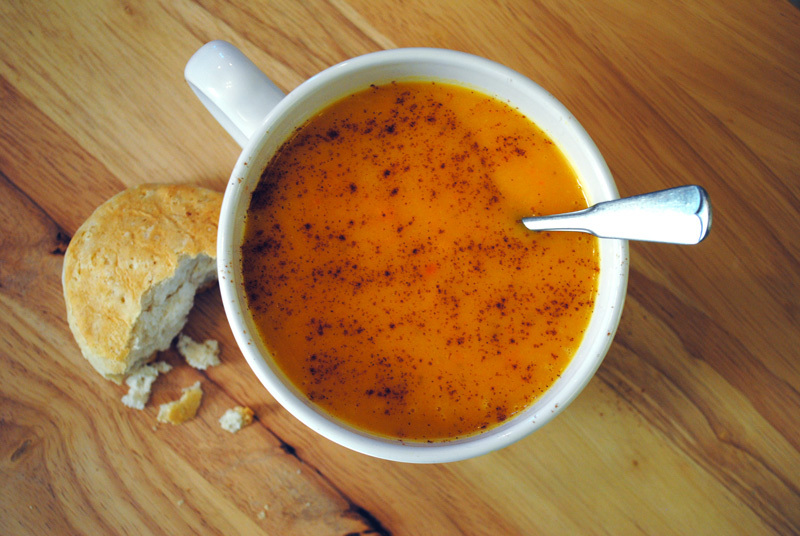 After a particularly frigid winter, I’ve officially declared this as my favorite snow-day soup. It’s creamy, delicious, and guilt-free because it’s basically all vegetables. Seriously, I love a creamy potato soup as the next person, but this will forever be my go-to soup on a cold winter’s day. It’s that good. When Sean and I are in the mood for this soup, we’ll make a big batch and freeze what’s left for easy dinners in the future. Then, all it takes is a little heat on the stove and some toasted bread or biscuits to dip into it. (Because what’s soup without some type of bread to soak it up?) A sprinkle of cinnamon adds the perfect touch of flavor that works with the coconut to make this dish feel more like a sneaky little indulgence. 1. 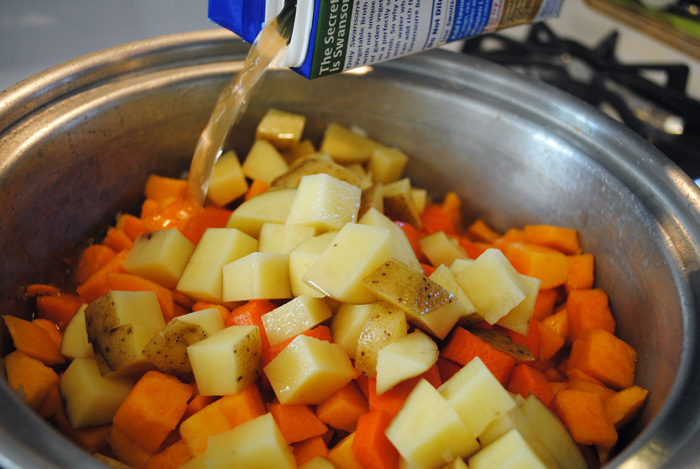 In a large pot, heat olive oil to medium-low. 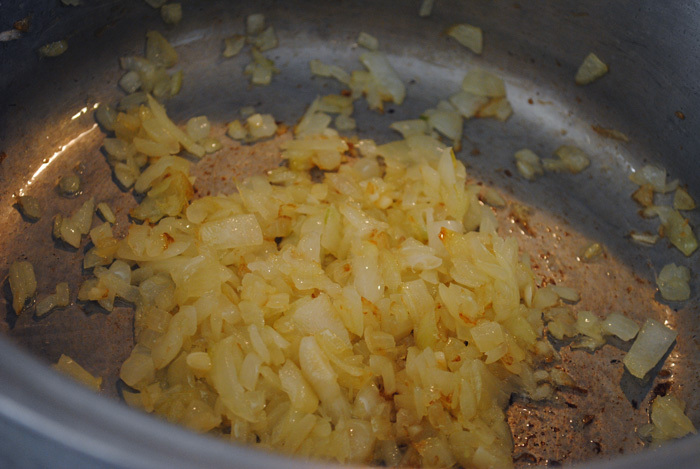 Add the chopped garlic and onions with a pinch of salt. 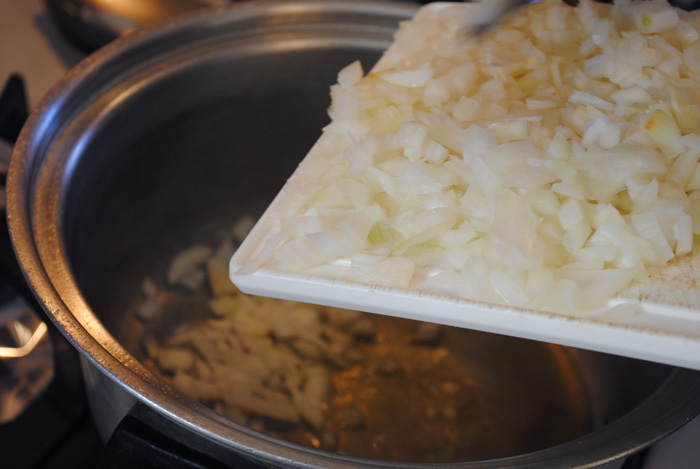 Stir all of these together and cook until the onions are translucent (3-5 minutes). They should look something like this. 2. 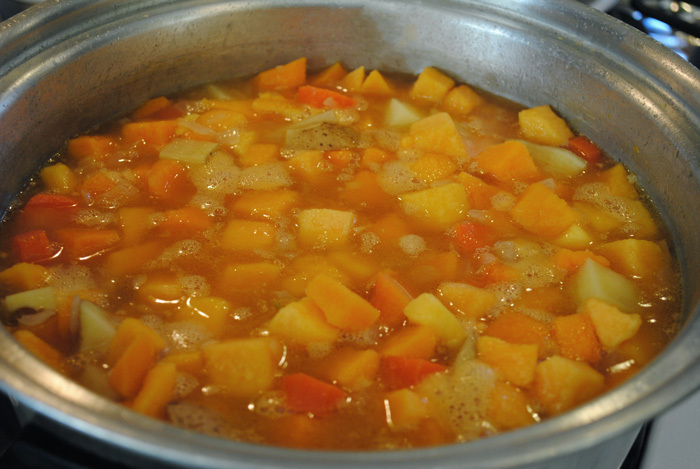 Add the diced squash, chopped carrots, potato and stock. 3. 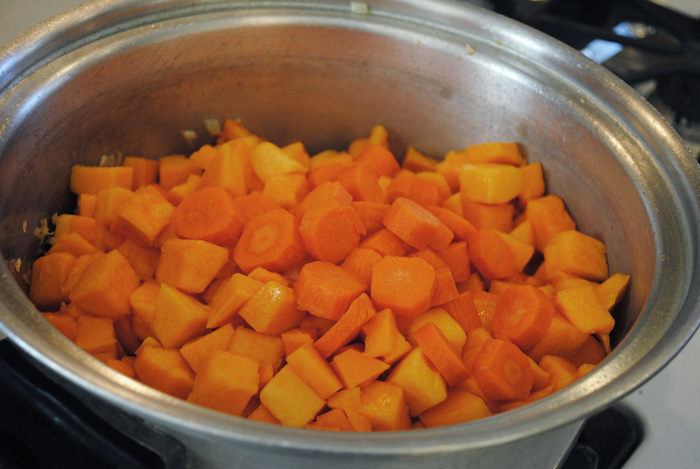 Bring to a boil, the lower heat to a simmer and cook for 25 to 30 minutes or until vegetables can be easily pierced with a fork. You’ll know it’s done when the squash and potato start to fall apart. 4. 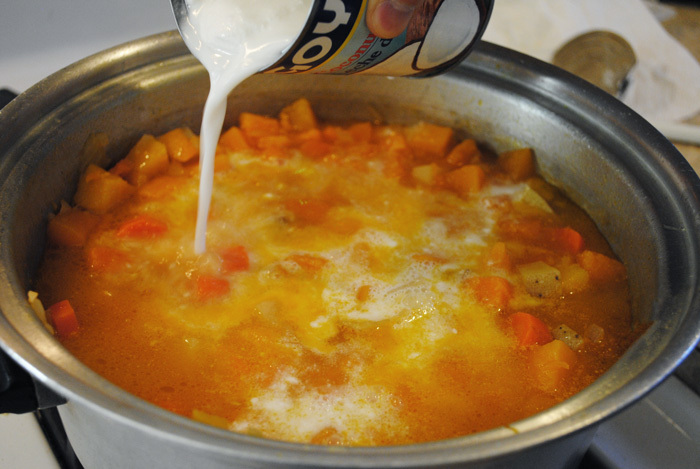 Remove from heat and add the coconut milk. Stir to combine. 5. 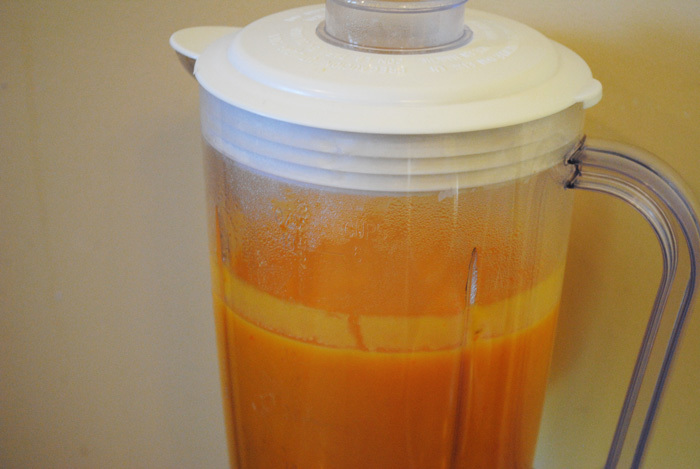 Puree soup in a blender, working in batches so you don’t overflow. 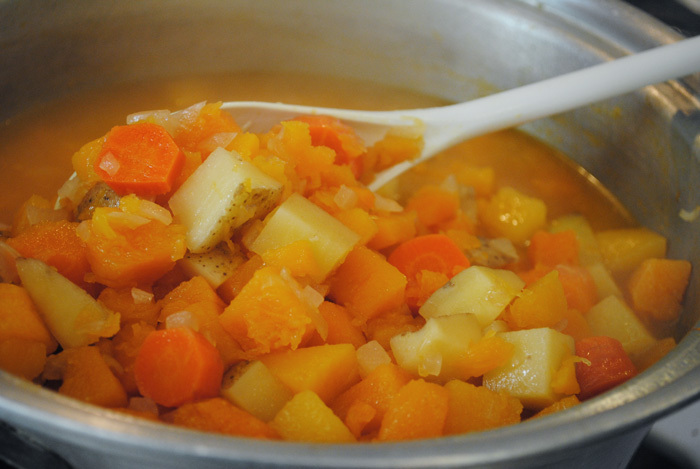 We find it helpful to transfer the pureed soup into a big bowl until the entire pot is blended. Then salt and pepper to taste. 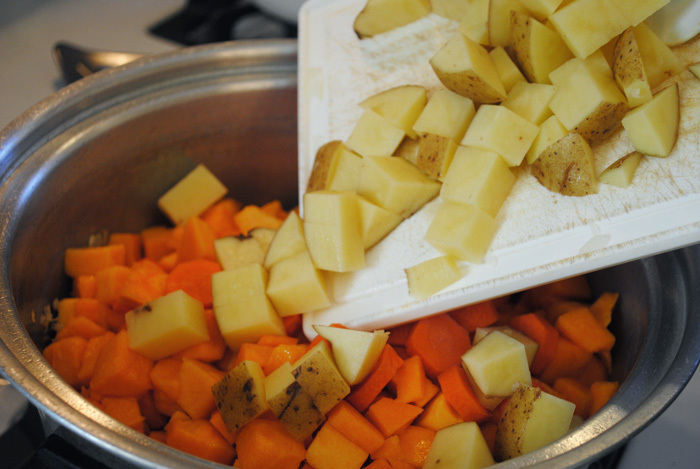 This really does make a lot of soup, so make sure you have a big bowl to hold it all in. 6. 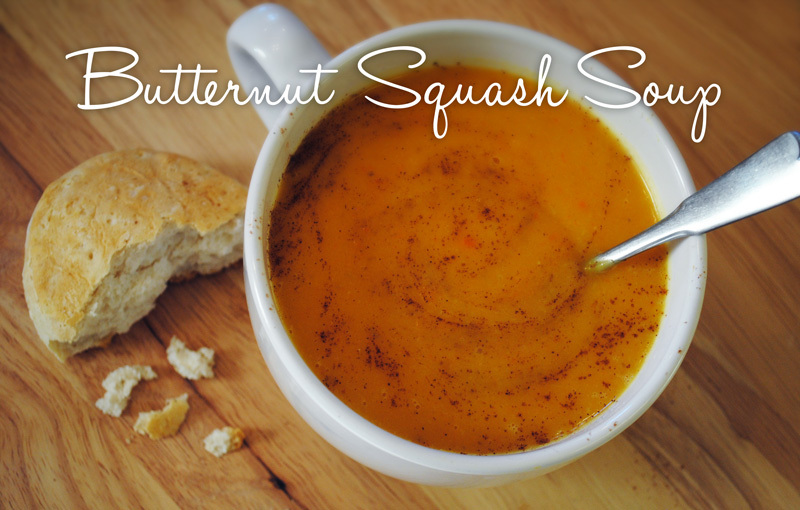 Toast up your favorite homestyle biscuit or crusty Italian bread and sprinkle soup with a touch of cinnamon. And that’s it! 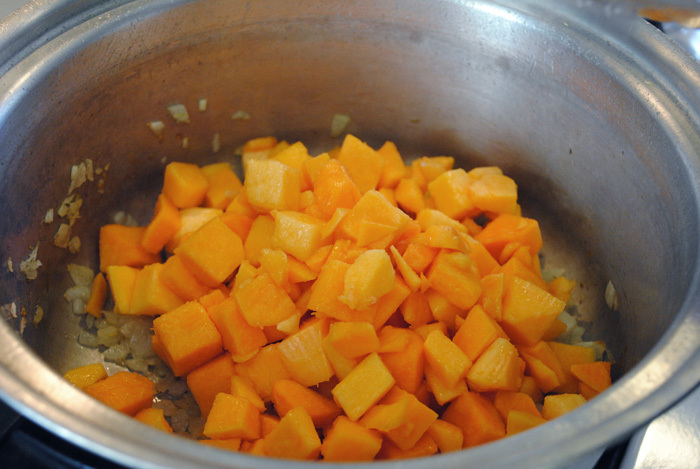 This butternut squash soup is SOUP-er easy to make, and definitely worth the time it takes to let it simmer. My favorite part is the taste of the coconut milk and cinnamon with the creamy texture. 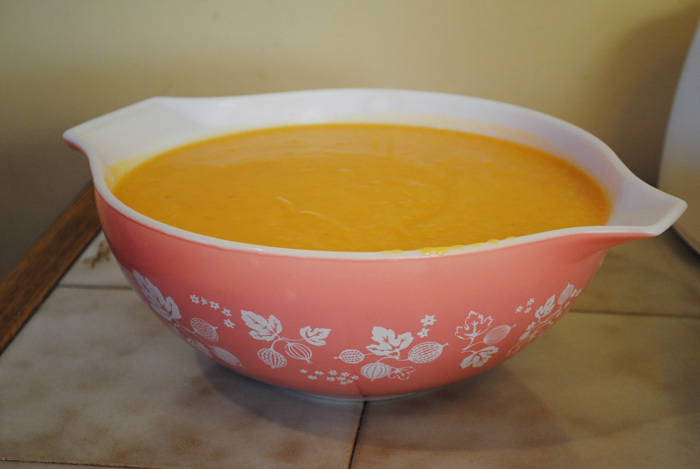 Now I’m hoping for another snow-day so I can indulge in another big bowl of this. What’s your favorite soup? Do you prefer creamy soups or ones with mostly broth? This recipe was inspired by Spark Recipes.